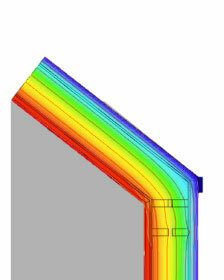 The Beattie Passive TCosy™ delivers a deep retrofit frame solution creating a void from foundations to roof; encapsulating the existing roof and external brickwork. This is injected with insulation to a give a highly efficient building envelope with no thermal bridges and greatly enhances the U-value of the walls and roof. MVHR: High performance heat recovery and ventilation. Full Heat recovery ventilation is installed into the new TCosy™ frame. Recovering 84% off the heat form internal heating sources and delivering fresh filtered all to all rooms. Incorporating the MVHR within the frame and penetrating only through the walls at high level minimizes internal disturbance and loss of internal space. "What every retrofit project needs is a low risk, whole building approach, capable of delivering superior thermal protection and air tightness, as well as fit for purpose heat recovery ventilation. Beattie Passive's TCosy™ does all of this and more."